As noted here, Marine Corps Times’ cover story this week will introduce tens of thousands of Marines to Sgt. Maj. Mike Barrett, who will become the 17th sergeant major of the Marine Corps on June 9. Cpl. 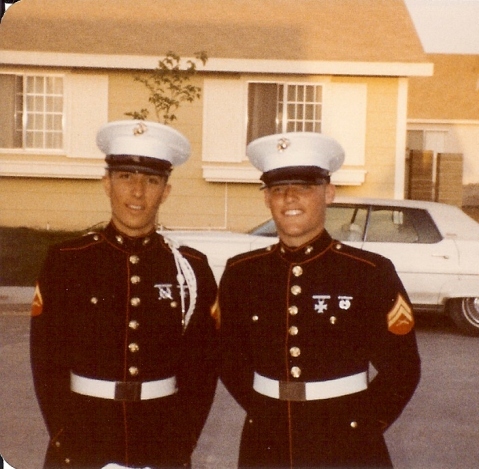 Mike Barrett, right, poses for a photograph with his friend, Lance Cpl. Mitchell Ybarra, in this 1980s photograph. The photo was taken outside Barrett’s mother’s house in Las Vegas in 1983, Ybarra said. Barrett confirmed he and Ybarra were friends and roommates while with 1st Battalion, 4th Marines. Barrett will step down as sergeant major of 1st Marine Division, out of Camp Pendleton, Calif., on Friday in preparation of him taking his new job, Marine officials said. Check out this week’s Marine Corps Times on newsstands for the full story or subscribe here. No EGA on Cpl. Barrett’s belt buckle? what does the white cord represents? The cords were worn by Aides. I think drivers, personal clerks to certain people had to wear them. There were different amounts of wraps on them and that was determined by who the person was, such a one wrap for a CO or two wraps for a General and so on. A Diplomat even rated one I think. If you had one, it got you into a lot of places, and out of some trouble sometimes. Uniforms sure have changed in the years. SgtMaj is an awesome Marine. We loved him in 2/7 and I know he will do an excellent job. Oohrah SgtMaj!!! Hey 03 for 2/7, i served with your unit in iraq from 06-07, Golf company, north of fallujah. OP Vikings. I am so very proud of my brother Michael who has always been a man of great distinction and honor to me and his many brother’s and two sisters. I know that he will do a fantastic job where ever he goes and whatever he does. Good luck Michael. Good to Go!! I work for his brother-n-law, I hope I get the opportunity to meet him. Semper Fi my Brother!! !